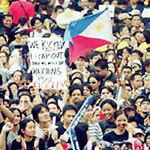 It's the 20th anniversary of People Power that ousted dictator Ferdinand Marcos out of the country in 1986. This was done in defiance of the 'then' formidable military might. People stopped tanks and assault vehicles with rosaries and prayers. To the uninformed, Power Power is what they call a massive rallying of the local citizenry against the president in power. It's the same People Power that brought down the presidency of Estrada (aka - Erap) and installed Gloria Macapagal Arroyo (GMA) as the new president, 7 years ago. Currently, GMA is still in power but her presidency is considerably weakened by widespread corruption within her administration, election fraud, and economic unrest. Cost of living is astronomically high and unwarranted tax levies are imposed on the people to fund what was stolen from the treasury. The plunder was to buy off people in her enemies' list who were in pursuit of her ouster. GMA is considered brilliant in using tax-payers money to buy off politicians, generals and detractors to perpetuate herself in power. So far, she has been successful. However, she no longer enjoys popular support. Idealist factions within the military are disgruntled for being used and receiving the short end of the stick. Solution? a coup d'etat during the People Power celebration. It was half-measured with poor planning though. It was foiled before it even got off the ground. Apparently, they didn't have the key people on their side. The coup plotters were rounded up and detained. GMA used this event to declare a national state of emergency. Orders were given to outlaw the People Power celebration. Why? Any gathering could potentially build up into another People Power and get her ousted. She didn't want this gathering to take place. Her political critics were arrested (Prof. Randy David included). Baton-wielding military and police personnel indiscriminately beat up people on the streets who wanted to be a part of this annual event. It was mayhem. Cops would stop jeeps carrying people to the event and confiscate their keys and then get them detained. It's ironic that GMA would outlaw the very same movement that placed her in power 7 years ago. It was martial law all over again. This time though, it's an undeclared martial law. For now, she seems to hold all the aces. The coup plotters are detained and the rallyists have been violently dispersed. The media organizations (particularly ABS-CBN) are given a stern warning to comply with government standards...or else. The general citizenry are outraged but feel helpless. This situation brings me to think of the political setup in Thailand. The Thais have a prime minister who conduct the day-to-day government. At the same time, they also have their king whom they revere. They hold their benevolent king higher than government and he serves as the moral conscience of the country. If the government gets dirty, the king can intervene and command their dismissal. He provides the check-and-balance at the highest level of government. He is empowered through his royal position and more importantly, by the staunch mandate of his people. What has this got to do with the chaos happening now? Plenty, but all in hindsight. During the first People Power revolution, Ninoy Aquino's widow, Corazon Aquino became president. In effect, she had revolutionary powers on top of inheriting the authoritarian powers of Marcos. She was perceived as the rosary-wielding widow who vanquished the iron might of the corrupt Marcos machinery. She symbolized a new hope for an ailing country. At that point, she was beyond reproach. She was the most trusted and most loved person in the archipelago. Her word was gospel. She was the pied piper who was followed by an entire nation with blind obedience. She could have appointed a president to run the country at that point, with her, assuming the crucial role of moral conscience of the people but having no political designation whatsoever. That ensures that government is run by people who are adept at politics but catapults her stature beyond government. Her mandate would remain inviolate. She can remove people who are incompetent or corrupt without rallying people to the streets. She could have been the moral provider...the check-and-balance the country was in dire need of. But no, she didn't do it. Without the political skill required to run a country, she assumed the presidency. She was out-maneuvered and out-classed the by slick and wily politicians who gradually ate up on her presidential powers. Neither was she effective in stemming the corrupt ways of friends and relatives that supported her. Her credibility was eroded through time. Now, she was unable to round up the critical mass needed to create a meaningful dent on the GMA incumbency. A new president can be elected every 6 years. But how often does it happen for a leader to emerge out of a ruined socio-economic landscape and serve as beacon of hope to a nation that went through 20 years of dark existence? In 1986, that leader was Cory. It's terribly bad she lost that historical opportunity. Had she chosen to be the moral head of the country (instead of president), she could have stopped this mayhem and pave the way for a smoother transitional government. In the meantime, GMA calls the shots. If she is able to change the constitutional charter as she plans, she'll make herself prime minister and in effect, be president-for-life.